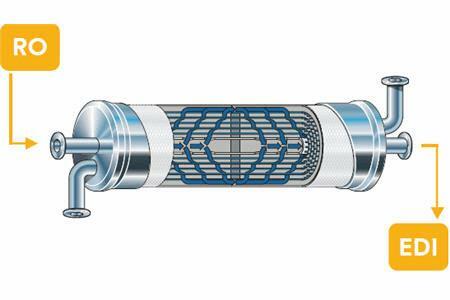 Electrodeionization (EDI) is a widely used water treatment process. EDI technology is an electrochemical process that uses ion selective membranes and an electrical current to continuously remove ions from water. The process uses ion exchange resin to remove the ions from the feed stream, producing pure water. A DC current continuously regenerates the resin. This technology operates under the same principles as conventional ion exchange resin technology with the added benefit of being a continuous process free of regeneration chemicals.